Composed by Johann Sebastian Bach (1685-1750). Edited by Uwe Wolf. Arranged by Andreas Kohs. This edition: urtext edition. Paperback. Barenreiter Urtext. Vocal score. BWV 232. Baerenreiter Verlag #BA05293-90. Published by Baerenreiter Verlag (BA.BA05293-90). ISBN 9790006532735. 27 x 19 cm inches. Key: B minor. 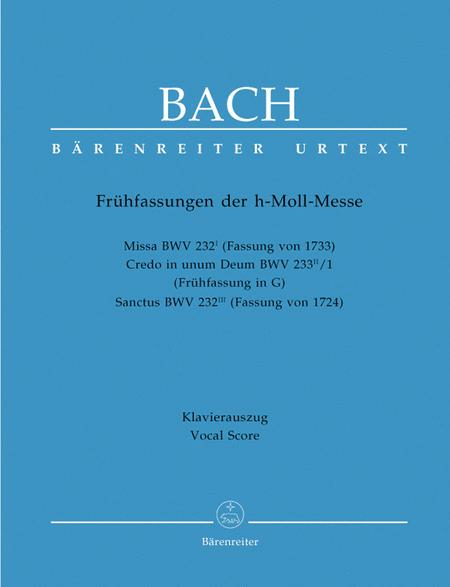 Several movements of what was later called the Mass in B minor were preceded by early versions: the Kyrie-Gloria Mass of 1733, the early G major version of the Credo rediscovered a few years ago in Gotha as well as the Sanctus of 1724. All of these shed interesting light on the history of this great masterpiece. For example, the brief Credo invocation differs from the later version in its choice of key, and the Sanctus was originally conceived for three sopranos, alto, tenor and bass. The Kyrie-Gloria Mass likewise reveals many independent and timbrally appealing departures from the corresponding movements in the familiar large-scale setting. 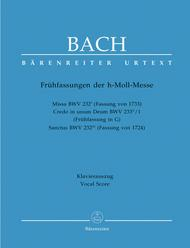 The corresponding volume of theNew Bach Edition(series II/volume 1a) serves as a conducting score.